World Cup fever hits outer space! I’m delighted to have guest author, Karen Inglis provide an extract from her book, Eeek! The Runaway Alien this week. We’re big fans of Karen’s books in our house. I hope you enjoy this too. 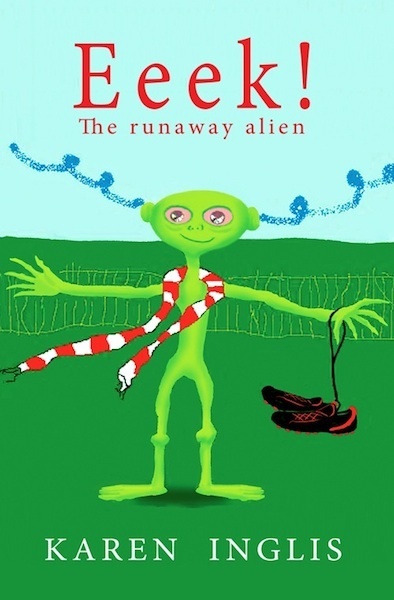 Now I knew Eeek was a runaway alien, many things became clear. His bedroom covered with Earth stuff. His excitement at the sight of the Red Arrows. His obsession with the England Football Team. Eeek must have dreamed of going to Earth just as I had so often dreamed of travelling into space. The only difference, of course, was Eeek could actually do it. But how long had my alien come to stay for? And why had he chosen me? These were questions that needed answers. Thump…thump…thump! A grown-up was climbing the stairs. I stared at Eeek in horror. He was about to be discovered by my dad! The door handle rattled. The door flung open. It was Rory – snorkel, batman suit and all – wheezing right at me again. I say ‘me’ because Eeek, miraculously, wasn’t there any more. Nor were any of his belongings. Rory wrenched the snorkel tube from his mouth. ‘Where’s that alien?’ he demanded, squinting right at me through his mask. It was then that I noticed his flippers. ‘What alien, dummy?’ I replied. Rory didn’t answer. He just shoved his snorkel tube back in, glanced around the room like a wary frogman, then thumped out. ‘Mind the stairs in those flippers!’ I shouted. Too late. Rory’s wailing at the foot of the stairs finally subsided, and the living room door slammed shut. ‘Eeek! Where are you?’ I whispered. No reply. I now spent several minutes looking for him. Under my bed? No. In the wardrobe? No. Outside on the window ledge? No. In my dirty underwear basket? Phew, no! My heart sank. No alien. No ‘Eeek’. Not a wisp of blue smoke, nor the hint of an echo. I flung myself back on my bed in despair – only to come face to face with Eeek, splayed across my ceiling like a grinning green gingerbread man. I had barely begun to enjoy my relief when, ‘rat, tat, tat!’, someone was knocking at the front door. ‘That must be Mum,’ I said. ‘Forgotten her keys again.’ Dad was still in the shed. Rory had the TV on full volume. ‘Don’t go away!’ I whispered up. Then rushed down. In fact it wasn’t Mum. It was an eager young man selling tea towels. Luckily Mum appeared at the gate right behind him just as I opened the door. She immediately told him that she had enough tea towels to start up a tea-towel rental company. The eager young man disappeared with a scowl. Mum switched off her iPod and jogged in. ‘Had a good morning dear?’ she panted as she passed. ‘Out of this world!’ I said with a snigger. ‘Great!’ she called, heading into the garden for a stretch. The lawn was scattered with garden tools, boxes of nails and screws, an old lawn mower and several identical packets of plant fertiliser. Dad poked his head out of the shed and smiled. He was in heaven! Mum started stretching between a fallen rake and the rusty barbecue. Unfortunately, as I turned to head back to my room Rory appeared. He had removed his flippers and breathing tube, and had his snorkel mask pushed up on top of his head. ‘Mum! We had an alien at the door this morning!’ he shouted eagerly. ‘Did you, dear?’ Mum was smiling sideways, her left ear almost touching the lawn as she stretched. ‘Yes, Rory,’ I said with a smile. I rolled my eyes at Mum. She raised her eyebrows, smiled back then winked. ‘Right, I’m going to do my homework,’ I said, trying not to smirk. Rory stood frowning at the lawn as I hurried past.